All our meats are smoked for 5 to 14 hours. Try our selection of southern style sandwiches. Did you know that we are also a Family Restaurant? All ages are welcome at all hours of the day in our establishment. We have quiet accommodations for parents, group areas, regular dining areas as well as a full-service bar and big screen TVs to boot! Bowtie pasta with smoked chicken and roasted vegetables in a classic alfredo or marinara sauce. Served with garlic naan. sauce over fettuccine. Served with garlic naan. An 8 oz wild Atlantic salmon fillet, topped with our house-made citrus soy glaze. Served with cheddar cornbread and your choice of two sides. choice of two sides and cheddar corn bread. green onions, maple syrup and crumbled bacon. Your choice of one side. rubbed and smoked for two hours. Served with gravy and your choice of one side. Chopped BBQ brisket on garlic toast, topped with Con Queso and crispy tortilla chips. Served with your choice of two sides. Two grilled chicken breasts with your choice of two sides. HUNGRY? DON’T FEEL LIKE COOKING? 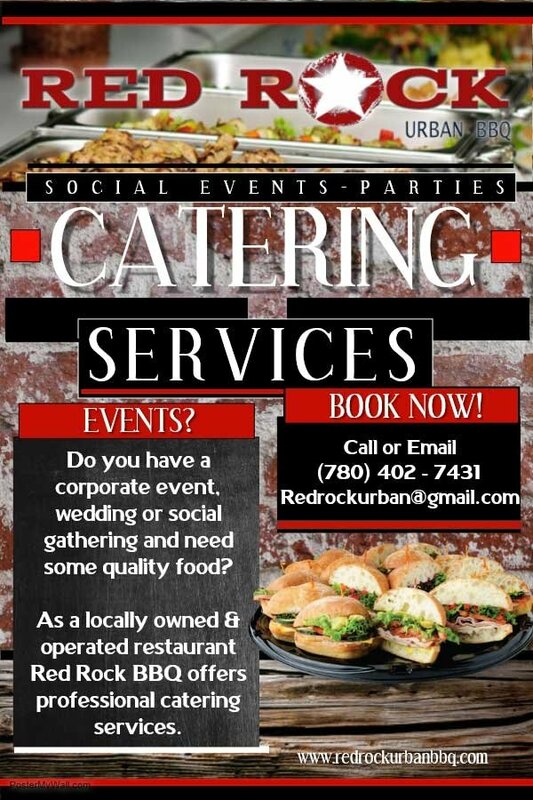 We have some of the best take-out food in Grande Prairie. Our food is made fresh, for you, right now, when you order. We have some of the best delivery food in Grande Prairie. No stale or cold fries. No missing gravy or utensils. We make our food right when you order, not yesterday. Try out our gluten-free and celiac friendly menu items. Eating out can be tough when you’re restricted by diet. We’re here to help. You need a spot to relax where you don’t have to worry about cross-contamination or risk of allergic reaction. We host events of all shapes an sizes. Whether you’re looking for a reason for a night out, or perhaps you need a venue for your next event, we have you covered. At our beautiful location in Southern Grande Prairie, Alberta, Canada. Smoked bbq everything!!! The food here is delicious and it has a good atmosphere as well! You can’t go wrong with anything on the menu! Red Rock is fantastic! The sandwich I had was delicious and the staff is very friendly!!! Go and sit in Missy’s section and she will take care of you! I highly recommend this spot if you’re looking for something fresh in GP. I’ve pretty much are everything on this menu and I love it. Go have some dill pickle soup is my favorite. The service is great and I love that’s its framily friendly. Prices are good and I enjoy the atmosphere. Love the boneless wings so tender. I think this is my go to place. The dill pickle soup, brisket sandwich, and spin dip appetizer were all awesome. Great food overall and good beer!